I love every season that is coming up next. Yes, even winter. Well, maybe winter because it's associated with Christmas. And because it's Christmas time, I celebrate it during the whole month of December. Now I have to admit, I'm not looking forward to January and February, as it wil be only getting colder and colder, without the Christmas cheer and decorations. Sounds depressing right? Instead of just focussing on the cold and the dark, think of all the nice things you can do during winter. 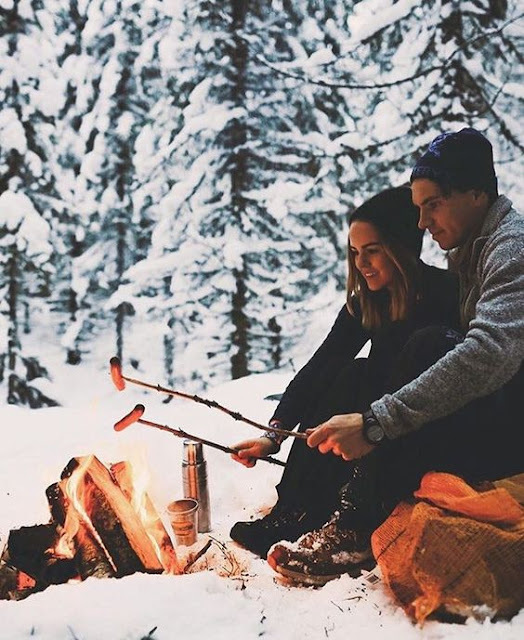 Make an outside bonfire: and make s'mores while wrapped up in a blanket next to your love. Go out hiking in the snow: and come home heating up with some hot coco. Read books: near the fireplace (or pretend fireplace). Ditch plans for eating out: and finally try that soup recipe you've been meaning to make. Try a new hobby or course: now is the time! Learn how to knit, follow a cooking class or follow an online course or watch a TED talk. Join the gym: during summer you love to run outside and now it's way too cold. And, if you sign up now, you beat the New Year's resolutions craziness + get a head start for summer! Enjoy the quiet and relaxing time: During Summer my whole schedule is fully booked. Of course very nice, but I actually enjoy the cooler times where I can really enjoy some quiet alone time with my loved ones.